FORT COLLINS, Colo. -- Customers of a Fort Collins dry cleaner are frustrated after going to pick up some of their favorite clothes only to find the shop suddenly closed its doors. After days of trying to get answers, Jane Reeve says she called Contact7 for help. 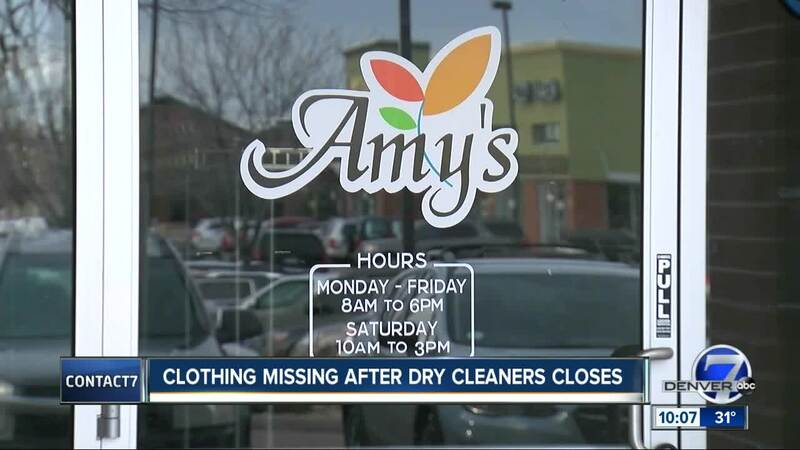 She tried to pick up her husband's business clothes from Amy's Green Dry Cleaning in early April but found an empty store instead. There was no sign on the door and her calls went to voicemail unanswered. “That’s what I would have expected, to see a notice on the door saying, 'We went out of business, please come on this date and time to claim your dry cleaning,'" Reeve said. The note Jane was hoping for is now placed on the door of Amy's Green Dry Cleaning, located near the intersection of E. Harmony Rd. and S. Timberline Rd. Contac7 talked to the owner of the shop, who says they had to close all of their locations because they were not making enough money to stay afloat. He is suing the former owners who sold him the business for fraud, and promises to give all of the clothes back. "Our company is making every single effort to get people's clothes back," Alan Witty said. "What we are going to do is a series of kind of pop-ups. So on Saturday of this week, one of our vans will be in the parking lot around Kmart in the area of College and Drake." Witty says he has several more pop-ups planned to return his customer's clothes, and signed an agreement to give the clothes that are not returned to the Scotchies Cleaners location at College and Horsetooth in Fort Collins.